A PAPARAZZI MAGNET . 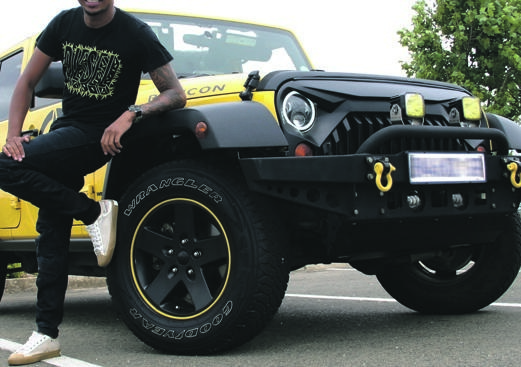 . .
PEOPLE can’t get enough of Tshepo and his wheels! Everywhere he goes, he gets asked for pictures of him and his manly ride. And Tshepo Mokwele, from Dawn Park in Boksburg, is always ready with a smile. Tshepo, who loves big, smart, luxury cars, sees himself owning a Ferrari one day. But until then, he will keep driving the 2016 Jeep Wrangler Rubicon he bought last year. Q: When did you buy your car? A: Last year, new from the box. Q: Does your car have a nickname? A: Yes, I call my car Rubi – it’s short for Rubicon. Q: Why do you love your car so much? A: I have a lot of reasons. I love her because she is very beautiful, big and powerful – I can drive her anywhere. She is the kind of a car that gets lots of attention., young people admire it and want to own it one day so in a way it’s also inspiring. A: No, she is my fourth car. I drive it on weekends only, it is so special to me. Q: Tell us what you like about this car? A: It is very good at towing, I have super bikes so it makes it very easy for me when I go to events. The sound system is standard but is the best. Q: Would you allow another person to drive it? A: Yes, but only my friends and family may drive her because I know that they are responsible drivers. Q: Have you driven any long distance trips in it yet? A: Yes, I have been to Nkandla and Richards Bay in KZN. Q: Tell us your choice of colour? A: I have always loved bright colours like red and yellow. Rubi is black and yellow. She matches my bike’s black-and-yellow colour scheme. It’s good and powerful on the road. Q: Have you changed anything? A: Yes, I changed the exhaust system to make her sound more aggressive when being revved. I changed the front grille and the lights to make them glow. I also added Jeep stickers on the doors. Q: When do you wash Rubi? A: Rubi gets washed every Friday like clockwork. She needs to look good for the weekend. Q: Is this your dream car? A: I love Rubi – and buying her was a dream come true – but she is not my dream car. My dream car is a Ferrari. A: Some are good and some are bad but there is nothing you can do except be careful, pay attention and be patient.